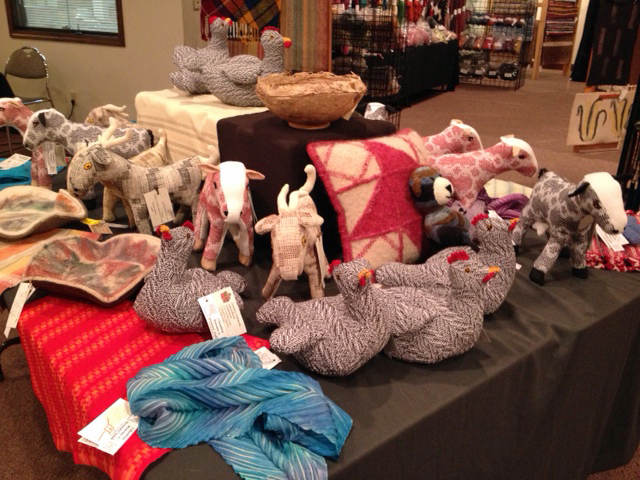 The past month has been a whirlwind of activity around our local Columbia Weavers and Spinners Holiday Exhibition and Sale. This was the 24th annual exhibition for us and a lot of energy goes into making it happen. A lot of energy comes out of it too! Creativity encourages more creativity! We always enjoy seeing what others in the guild are making and we joke about being our own best customers. One member will encourage another as we bring in towels, runners, scarves, rugs, and jewelry. Some have worked all year for this one event; for others, this is one exhibition among many. Regardless, it comes together for three days of delightful fiber fun! And we all come away with ideas and plans for our next project at the loom and spinning wheel. Do you have a fiber event coming up in your area? Check it out for some unique gift ideas and support your local fiber artists!